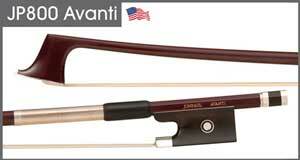 The JonPaul Avanti violin bow is hand made in the USA. Features include: one-piece exclusive grade carbon composite round stick, burgundy walnut finish, top grade silver mounted frog, silver tip, and a Parisian eye. Available in full size violin.